Following reports that a man was feared dead after being beaten by operatives of the Special Anti-Robbery Squad in Ogba two day ago, the Lagos state police command has reacted. In a video shared by Instablog, eyewitnesses said the incident happened at Haruna Bus stop after the victim had just stepped out of an eatery when he was accosted by some SARS officers who demanded a phone check, but he refused. Angered by his refusal, they descended heavily on him, as seen in the video above. He reportedly died later. While reacting to the report, the Police Public Relations Officer, Lagos state SP Chike Oti said the story is unfounded. ALLEGATION THAT A CITIZEN WAS BEATEN TO DEATH BY SARS OFFICERS, UNFOUNDED. 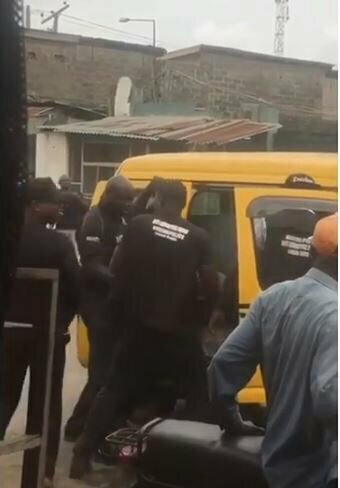 The attention of the Lagos State Police Command has been drawn to the news making the rounds on the social media that SARS operatives, on Monday 9th of April, 2018, beat a citizen until he was dead. Based on the video clip of the incident which went viral on the social media, the Command began an investigation into matter. Part of its findings was that no such incident took place at Haruna Bus stop, Ogba on Monday 9th April,2018; there was no record of it being reported at any of the police formations within Ogba Area Command nor was it reported at any of the Command’s complaint platforms. Besides the above, it is a common knowledge that such an incident cannot happen in the city of Lagos without an uproar at the venue of incident; it is in this regards that plain clothes detectives were deployed to enquire from the people living and doing business around the popular Haruna bus stop whether such incident ever happened in their area and not a few were embarrassed by such question because according to them it never happened. The Command therefore wishes to advise the public to take unverified news emanating from social media platforms with a pinch of salt. Media houses of all categories are also advised to seek confirmation of information available to them from the police before pushing it out to the public. 0 Response to "Lagos Police Reacts After SARS Operatives Allegedly Beat Man To Death"